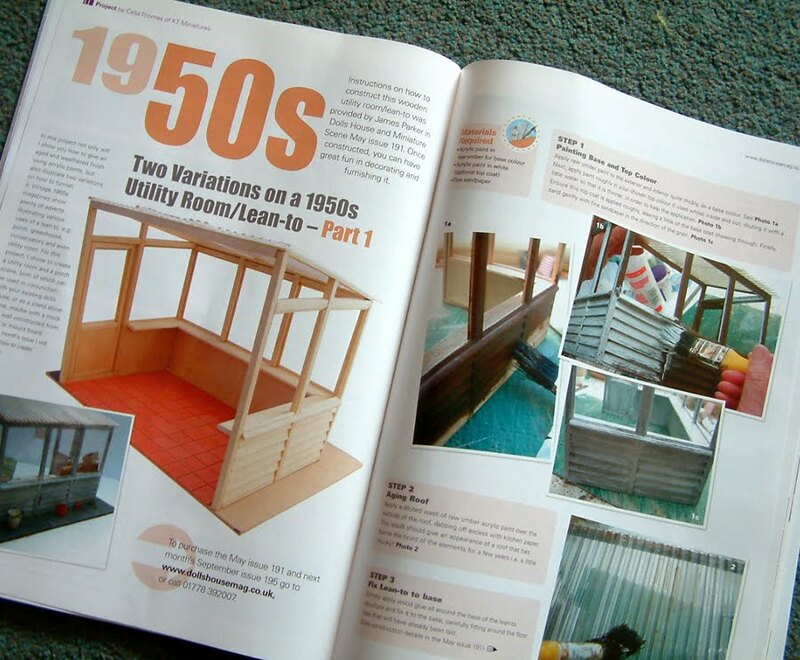 Part One Of 1950's Lean-To Project Out Now! 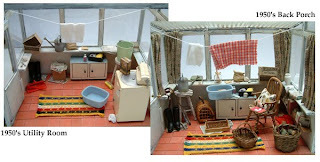 Part One of my Lean-To project (information previously shown on here- see May Archive - Variations of a 1950's Lean-To) is now appearing in the latest August Issue (no 194) of Dolls House & Miniatures Scene Magazine. This first part tackles how to decorate the exterior and interior walls and roof of the actual lean-to, giving it an aged and weathered look. Plus how to cut the paving and create a simple tiny garden area. 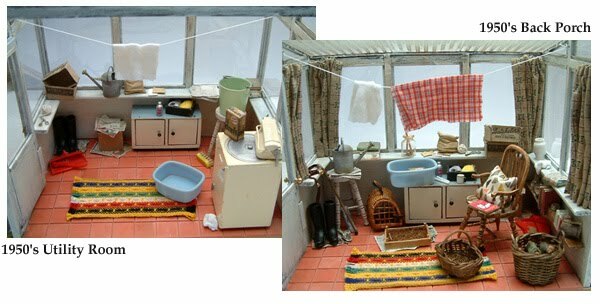 More instructions on how to furnish it as a 1950’s porch and as a 1950's utility room will appear in the next issue (September No. 195) I understand. 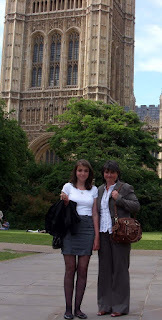 yesterday was quite a fabulous day as my daughter and I went to an awards ceremony at the House Of Lords. Some of you reading this will not be aware that the Thame Dolls House & Miniatures Fair that takes place each February here in Thame, has been running for a few years now and apparently we have managed to raise over £15,000.00 for Breast Cancer Campaign during that time. 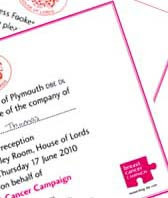 Now the scary bit.....I was informed by the charity a few weeks ago that I had been nominated for an Outstanding Contribution to Breast Cancer Campaign Award and was invited, along with daughter, to the awards ceremony in London last night. Well, yesterday daughter was picked up from school half way through the afternoon, who had just finished her Geography exam so was not in the best of moods, changed into our outfits (dress code was smart/business) and we dashed up to London on the train. Ones new shoes were already killing ones feet so we grabbed a taxi to the House of Lords....damn the cost! Oh how pretentious it sounded when on being asked by the driver where did we want to go....and having to reply “The House of Lords please”! Then the time came to go inside and once through the scanners and security, we made our way through this incredible building to the Cholmondeley Room which had a terrace right on the Thames. The building itself is magnificent, utterly steeped in history and oozing with atmosphere! The canapés that continually came around were exquisite but I had no idea most of the time what was in them! There were loads of people there from all walks of life, Kate and I kept wondering who was who.....but without my glasses I could not read their badges....short of squinting at them close up would have been extremely rude, so we just had to be content in trying to guess. Kate whispered to me..."we don’t know anyone here” ... and she was feeling quite overawed so I decided what the heck and just looked for someone with a badge like ours (Supporter Of Charity) and struck up conversation. As it happened, people chatted freely & what brilliant stories they had to tell! Then the speeches and various awards commenced. As for the award.....well I was a runner up (the winner was far more deserving and had raised a huge amount) but it was still a great honour to be nominated and what a brilliant time we had. It was also a very humbling experience as I spoke to some amazing people who have had to deal with real adversity through their illness but through some amazing strength of character manage to turn their illness round into something positive and fundraise themselves for the charity. There were scientists also at the event who are working furiously in trying to find better treatment and hopefully one day an absolute cure for the disease. 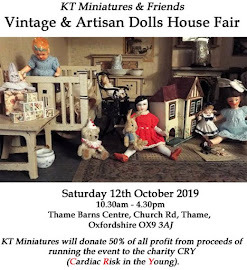 Their research is funded by any money raised for Breast Cancer Campaign so please, I hope that you will all join us once again at Thame Dolls House & Miniatures Fair next February, and help raise lots of money for the charity. Although I am no longer able to organise the event, I will still be responsible for the Breast Cancer Campaign Sales Table and Grand Raffle, so do come and see us all there. I thought I would share with you another project I have just been working on these past few days and although the exterior is not quite finished yet, the interior is complete. It certainly has been a fun project to do with my brief being to produce a 1930s General Store scene inside an MDF room box with removable perspex front. 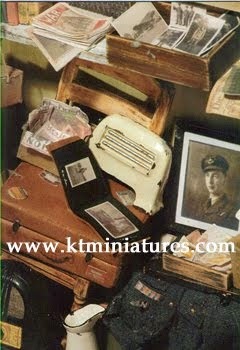 There was to be much 1930’s packaging crammed on shelving with a variety of products on show. I certainly enjoyed all the research for the packaging and how wonderful the power of the internet is for such projects, where I found such great inspiration! The majority of the packaging I mocked up myself and I hope to use some of this packaging in some near future projects .....(so watch this space)! For added interest an area was created in the left hand corner with a door that when opened revealed a tiny back lobby with a further fixed back door, crammed full with more boxes etc. This gives the whole room box extra depth and significance. These two fabulous character dolls have been created by Robin Britton of Coombe Crafts. Robin’s dolls are just so different and full of character, plus what I love about them is that they can be manipulated into all sorts of poses. The central cabinet with perspex frontage is removable so that extra packaging can be added at any time....cunning eh? 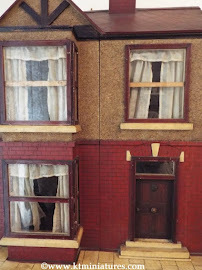 So there you are.......hope you enjoyed taking a peek into this little shop. Hello...I Am Back & Some Brilliant News! Just to let you know that I am now back from a wonderful relaxing holiday in Devon & Cornwall, (complete with a bit of sun tan which makes a refreshing change as it usually rains prolifically whenever I go to the seaside), so if you have been wondering why I have not been replying to your enquiries, that is the reason. I am slowly working my way through a backlog of your emails & phone messages so thank you for your patience. 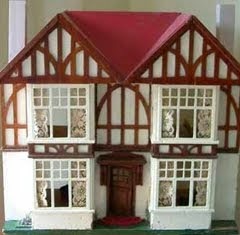 Meanwhile I am thrilled to bring more news of monies raised at Thame Dolls House & Miniatures Fair that took place last February. 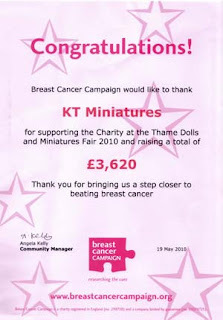 Just before I left for my holiday I received official confirmation along with a certificate from the Breast Cancer Campaign, that our final amount raised had been boosted even further by the efforts of Rosemary Farr, who managed to get the Abbey National to match her £150.00 worth of donations of miniature items to the Breast Cancer Campaign Sales Table. (Incedently, Rosemary also put in the highest bid for the charity auction at the event so is now the proud owner of "A Box Of Memories"). Therefore this does mean that our final total raised for the charity is now a totally amazing £3, 620.00!!!! So thank you Rosemary and thank you Abbey National! !